It should go without saying that I am not a fan of Dr. Oz. I’ve never actually talked about him on this blog before, but I have alluded to him many times. Dr. Oz sold out a long time ago, and this isn’t surprising for an Oprah protégé. Dr. Oz has long preyed on the gullible and scientifically illiterate; indeed, I believe he contributes to this nation’s scientific illiteracy. Dr. Oz has long been America’s leading promoter of all sorts of weight loss scams, and many other forms of quackery/alternative medicine. The fact that he is a highly accomplished physician and cardiothoracic surgeon means he should know better. Whether or not he really believes in what he promotes on his show is beside the point. Only Dr. Oz knows what he really believes deep down inside. I don’t get why you need to say this stuff because you know it’s not true. So why, when you have this amazing megaphone, and this amazing ability to communicate, why would you cheapen your show? How many times I’ve thought of asking him questions like that! I’m sure many of you know what the “Dr. Oz effect” is. Dr. Oz mentions a new weight loss “miracle” on his show, and weight loss pill manufacturers immediately start cashing in. While Dr. Oz doesn’t make money from these pills, these types of programs certainly help boost his ratings. His audience probably wouldn’t be as big if all he ever promoted was diet and exercise for weight-loss, which is the only safe and effective weight-loss strategy. Of course, he does often mention exercising more and eating less, but it is still irresponsible of him to promote ineffective weight-loss pills to his audience. Many people watching his show get the idea that if they take these magic pills, they can eat all the bacon, cake, cookies, and ice cream they want(there’s even a sick phenomenon called “Bacon Mania“). I find it interesting that the thing that bothers Dr. Oz the most is that his name and image are being used without his permission by unscrupulous supplement manufacturers, which makes him a “victim”. This is a legitimate concern, but what about all the people getting taken advantage of? Dr. Oz also insists that he believes in these pills, and if he was irresponsible in any way(besides using “flowery” language and being “passionate”), it was because he never told his audience to purchase pills from companies he finds reputable(I’m not sure if he will ever produce this list). This of course misses the entire point that if something doesn’t work, it doesn’t work, regardless of what company it comes from. Besides this, I hardly see Dr. Oz as a “victim”. No one held a gun to Dr. Oz’s head and forced him to push weight-loss scams and other quackery on his show. He is not a victim. The real victims are the people who have wasted their money on the ineffective pills he’s promoted. Dr. Oz may not directly financially benefit from the pills, but he is as much a part of the problem as the pill manufacturers. Meanwhile, America continues to get fatter. As a result of these hearings, I’m pretty sure Dr. Oz will tone things down a bit on his show to slip below the radar, but this will almost certainly hurt his ratings. I also don’t think these hearings have damaged his reputation, at least not with fans. He still has his cult-following, and I don’t believe any amount of information will sway them. For the conspiracy-minded, the fact that he was called in for questioning and asked all these tough questions is just more evidence(to them) of some vast, evil conspiracy that is trying to discredit quackery. It’s been said so many times before, but it has to be said again: Weight loss does not come in a pill. It can only be achieved through exercise and eating less/eating more low calorie foods. Fitness is a lifestyle, not an activity. Cinnamon is by far the spice I love the most. Its sweet, strong, complex taste is almost magical to me. In part, this is why I’ve closely followed the news about it for so long, especially about its potential as a type II diabetes treatment(not type I). Early studies on cinnamon suggested it could lower both glucose and cholesterol levels. Cinnamon use in type 2 diabetes: an updated systematic review and meta-analysis. The consumption of cinnamon is associated with a statistically significant decrease in levels of fasting plasma glucose, total cholesterol, LDL-C, and triglyceride levels, and an increase in HDL-C levels; however, no significant effect on hemoglobin A1c was found. The high degree of heterogeneity may limit the ability to apply these results to patient care, because the preferred dose and duration of therapy are unclear. It looks like there is still some promise here, though if you have type II diabetes or suspect you have it, go see a doctor as soon as possible, don’t try treating it with cinnamon. While this meta-analysis indicates some positive effects, it also notes the inconsistency of some of the evidence. In large part this is because of how the amount of biologically active chemicals in cinnamon are highly variable. Besides this, some of the other hundreds of chemicals in cinnamon may interfere with the glucose-lowering chemicals effects. This isn’t unique to cinnamon though; this is a limitation of just about all other herbs or spices people use for their supposedly therapeutic effects. To further complicate matters, I believe most scientific studies that have been done on cinnamon used Ceylon cinnamon, often called true cinnamon(cinnamomum verum), rather than cassia, which is also known as cassia cinnamon(Cinnamomum cassia), or colloquially as “Chinese cinnamon”. In North America, cassia or Chinese cinnamon is much more common, and cheaper, than Ceylon(true) cinnamon, and may have somewhat different medicinal properties, besides tasting sweeter than cassia. In the U.S, what we call “cinnamon” is almost always cassia, and it is what is generally sold in most stores and supermarkets(in Europe, Ceylon cinnamon is much more common). While true cinnamon and cassia are closely related, cassia has a lot more coumarin, which has powerful anticoagulent effects, besides being toxic for the liver. Consuming very large amounts of cassia on a regular basis may be dangerous for some people. This is why Ceylon cinnamon, which has little to no coumarin, is probably safer to use in large quantities. If you want to purchase true Ceylon cinnamon, you may need to go to a specialty market to find it. Make sure the container clearly says it is “Ceylon cinnamon”. It will almost certainly come from Sri Lanka(Ceylon), which produces about 80 – 90% of the world’s supply. On a related note, marjoram in the U.S is often labeled as “oregano“. Though they are closely related, oregano is more peppery and zestier than marjoram. Next time you think you’re adding oregano to your pizza or pasta, there’s a good chance it is actually marjoram. Regardless of its medicinal potential, I love sprinkling cinnamon on oatmeal or pancakes. I love the sweet fire that is cinnamon. This post is similar to the one I did on arginine not too long ago. Basically, omnivores generally get enough carnitine, but many vegetarians and vegans probably don’t, so in theory they may benefit from supplementation. This may be particularly true of vegetarian and vegan endurance athletes. What is carnitine? It is a quaternary ammonium compound biosynthesized from the amino acids lysine and methionine. 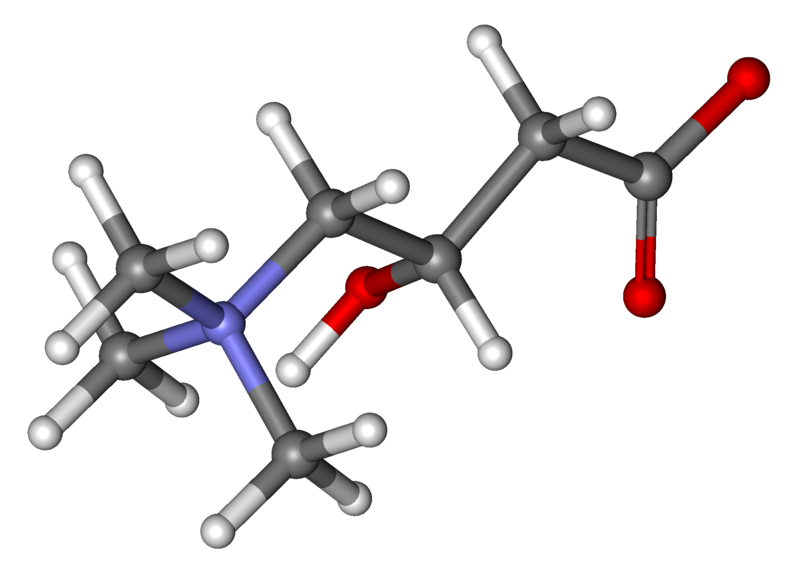 It is used for the transport and metabolism of fatty acids. High amounts are found in red meat and in dairy products to a lesser extent. Little to none occurs in plants. Since the body also synthesizes carnitine from lysine and methionine, getting enough of these amino acids can help ensure adequate amounts. Whatever you do, don’t confuse carnitine with carnosine! An average carnitine level in vegans was significantly reduced with hypocarnitinemia present in 52.9% of probands. Similarly, the intake of methionine and lysine was significantly lower in this group due to the exclusive consumption of plant proteins with reduced content of these amino acids. I don’t believe this should scare anyone into eating meat. After all, I am a vegan! But it may be helpful to be mindful of such things. Don’t forget that there are some vegans out there who, for whatever reason, fail to thrive on the diet. There are also a lot of former vegans. Maybe lack of carnitine and/or some minerals like iron or zinc are part of the reason why. Another reason is that there are, unfortunately, a lot of junk food vegans out there who consume way too much sugar and fat, and not enough fresh fruits, vegetables, legumes, and whole grains. This could lead to a serious deficiency of one or more nutrients. Here is an old, though interesting carnitine study: Systemic carnitine deficiency exacerbated by a strict vegetarian diet. In conclusion, acute administration of L-carnitine did not affect the metabolism or improve the physical performance of the endurance-trained athletes during the run and did not alter their recovery. It did nothing! I do wonder though if the runners had been vegan if they would have benefited. Hopefully, researchers will do a study like this some day. At best, I could find a study which showed that Short-term carnitine supplementation does not augment LCPomega3 status of vegans and lacto-ovo-vegetarians. This means that supplemental carnitine in vegetarians doesn’t help convert one form of omega 3 fatty acid(ALA), to the other vital omega 3s, DHA and EPA. This conversion is important since vegans and vegetarians may sometimes be lacking in DHA and EPA. However, we are getting a little sidetracked here. These studies demonstrate that ALC treatment is efficacious in alleviating symptoms, particularly pain, and improves nerve fiber regeneration and vibration perception in patients with established diabetic neuropathy. This sounds promising, though more research obviously needs to be done. If you’re a diabetic with nervous system problems, don’t take this as a recommendation to supplement with acetyl-l-carnitine. Speak with your doctor. So where does this leave us with respect to carnitine? I don’t supplement with it, and I show no deficiency symptoms, and neither do most vegans I know. It’s possible the bodies of people who may be lacking in carnitine compensate somehow. After all, running 2 marathons while juggling and finishing in under 4 hours, while having been a vegan for years is pretty good evidence I’m not deficient in anything. 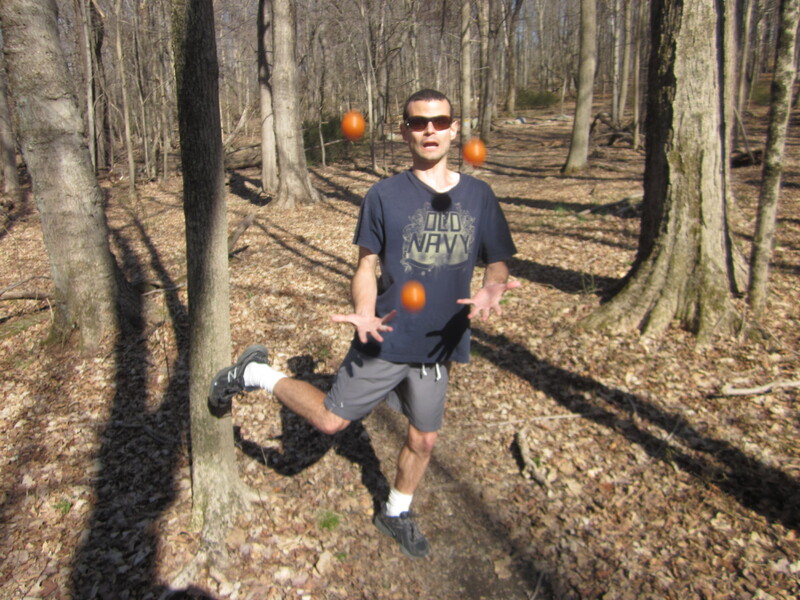 The same goes for vegan super stars like Scott Jurek. All I take is a multi-vitamin. Like I said before, it is possible that carnitine is something vegans may be lacking in that may explain why some fail to thrive. If this applies to you, see if you can get your blood tested for carnitine or other compounds to see if you are deficient. Though they went extinct about 30,000 years ago, Neanderthals are making big news these days. Thanks to recent advances in gene technology, scientists(Sriram Sankararaman and others) now have access to a fuller, more accurate Neanderthal genome. This allows scientists to give a more definitive answer to the age old question “how much did modern humans and Neanderthals interbreed?” Apparently, a lot more than what was previously thought. For decades, it was assumed that the ancestors of modern humans and Neanderthals didn’t interbreed, or that if they did, Neanderthal genes were selected out. Now it looks like some interbreeding did take place in Eurasia, but not in Africa. Hence, caucasians and east Asians have traces of Neanderthal genes, while black Africans do not. Whether or not Neanderthals were a separate species or sub-species of human is a controversial issue among anthropologists, and is beyond the scope of this post. It is estimated that about 2% to 4% of the genetic blueprint of non-Africans is derived from Neanderthals, with east Asians having slightly more. Interestingly enough, these genes appear to be partially responsible for diabetes, Crohn’s disease, and even difficulty quitting smoking among modern humans. If you suffer from one or more of these issues, you may be understandably upset that at least one of your ancestors married a Neanderthal. Then again, Neanderthal genes may also have their advantages, like coding for thicker, cold-resistant skin. Also, the genes that play a role in disease or addiction today may have been helpful thousands of years ago. Red hair in humans may have first evolved among Neanderthals, so if you love your red hair, this may be due to Neanderthal ancestry. Neanderthals were also generally shorter, and had bigger skulls than the Homo sapien invaders from Africa. The specific reasons why the Neanderthals went extinct is still something of a mystery – the idea that they were “dumb” doesn’t hold much water. We know they were out-competed, but we don’t know why exactly. Maybe these recent discoveries will lead to a split within the Paleo diet movement: those who are more Neanderthal can eat one way, while those who are more Homo sapiens can eat another. 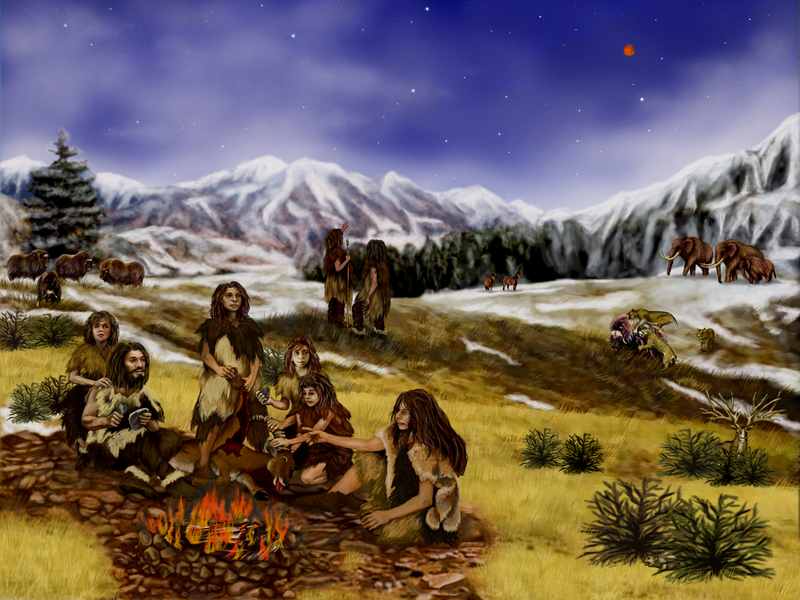 It is well-known that Neanderthals were generally big meat-eaters, while early modern humans ate a more diverse diet. As both science and technology continue to advance, we can expect many more startling revelations about human origins. I would personally love to see better research on early human and early chimpanzee interbreeding, especially the last times humans and chimps ever successfully interbred and what genes, if any humans got from chimpanzees. Unlike more recent Neanderthal-Homo sapien interbreeding(tens of thousands of years ago), early human-chimpanzee interbreeding likely took place more than a million years ago, so it may be difficult to find reliable DNA specimens, among other limitations. Want to make your pancakes extra fluffy and tasty? Nothing will help achieve this better than beer. That’s right, beer. Most people think of it as just a beverage, but I think it is one of the most underused food items for making delicious meals. The bubbliness of the beer helps make the pancakes extra fluffy, while also imparting a more complex, deeper, somewhat earthy kind of flavor to them. I can’t even remember last time I had regular pancakes. 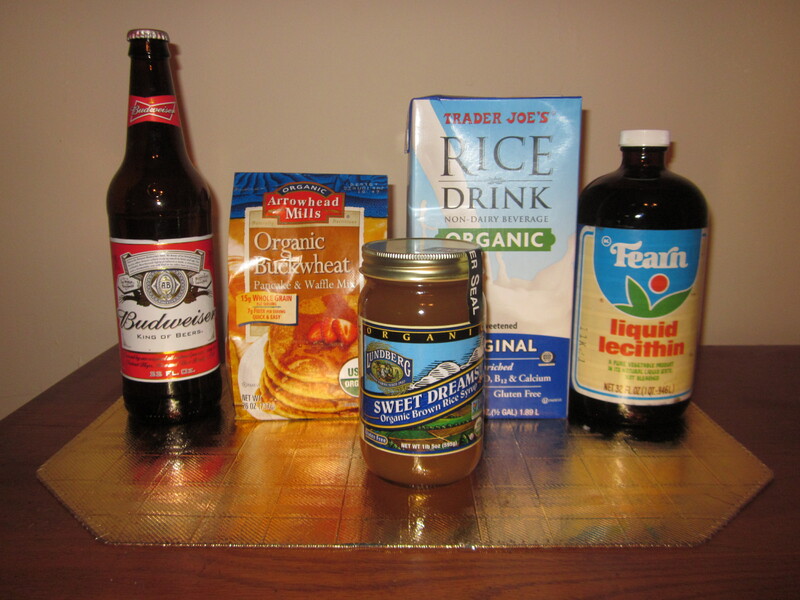 This is how indispensable beer is for making pancakes to me, and I don’t even like beer as a beverage. And obviously my pancakes are 100% vegan. I love buckwheat since it’s a nice change from the usual grains I eat, and its a good source of quality protein. It’s not necessarily better tasting, but it’s different. Buckwheat was commonly eaten in 19th century America, but it was eventually supplanted by corn and wheat which are easier to grow. Buckwheat pancakes were even one of Mark Twain’s favorite foods. 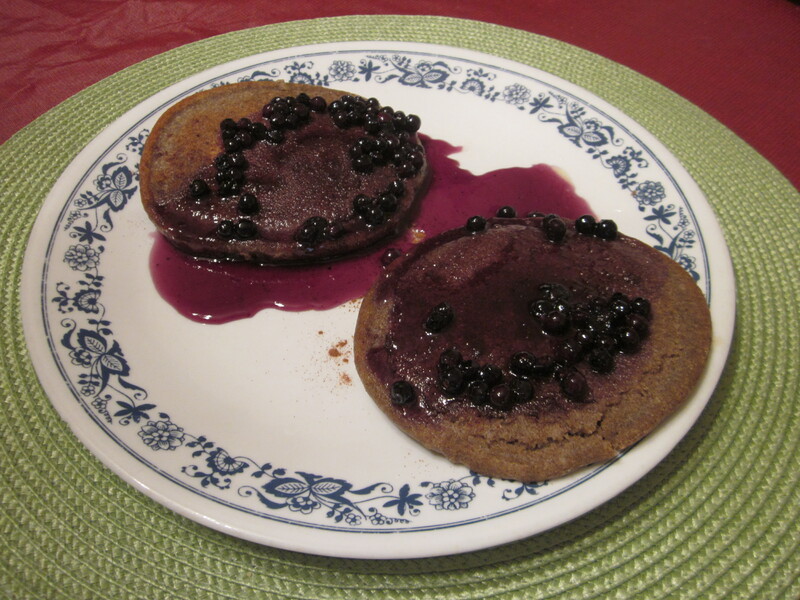 So these buckwheat pancakes are an old-fashioned favorite with a modern vegan twist. Mix very thoroughly in a bowl. I don’t think the alcohol content of the beer or type of beer is that important. I used Budweiser, which is 5% alcohol. Go ahead and use a light beer if you want. If you’re worried about the alcohol content, keep in mind that a significant portion of the alcohol is removed through the cooking process. Just to be on the safe side, I think pregnant women shouldn’t eat this, unless very low alcohol beer or alcohol-free beer is used(or just use very little beer by diluting it with rice milk). For the syrup, I mixed Lundberg organic brown rice syrup with some frozen blueberries and heated it on the stove. I am not sure if the brown rice syrup is healthier than maple syrup, but it does have a little bit less simple sugar. After just a few minutes on the olive oiled griddle at medium heat on each side they will turn a golden brown, indicating they are done! The beer/buckwheat/olive oil aroma coming off the griddle as they cook is heavenly. I added a dash of cinnamon before pouring the blueberry syrup on them. After running 52 miles in the past 3 days, my muscles definitely needed the high carb and sugar content of this meal to refuel my depleted glycogen stores. Although pancakes are usually eaten for breakfast, I had these for lunch after a 10 mile run. Organic buckwheat flour, organic whole grain wheat flour, organic soymilk powder, baking powder(monocalcium phosphate, sodium bicarbonate, corn starch), sea salt. This is my favorite buckwheat pancake mix because it has few ingredients, most of which are wholegrain, it is vegan(no whey, or milk ingredients), and has no added sugar. 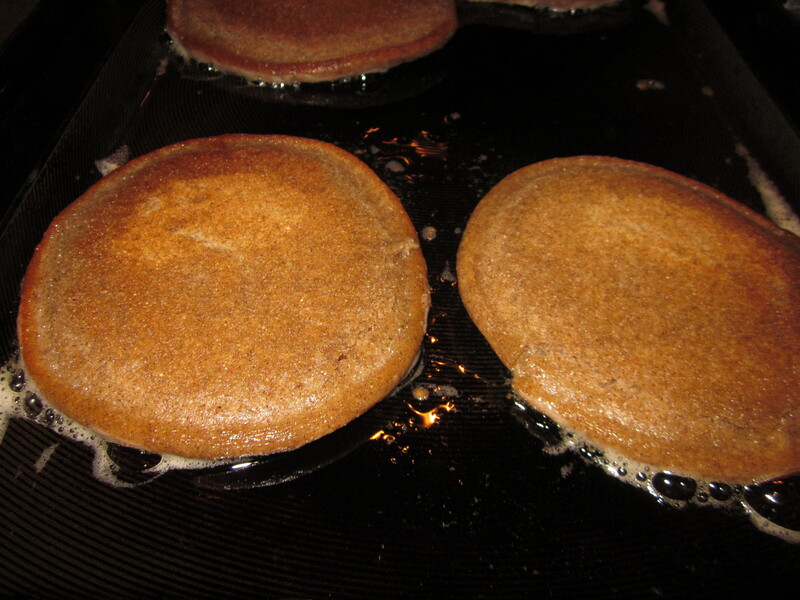 One of these days I may try making buckwheat pancakes from pure buckwheat flour, which means I’ll probably have to add baking powder to the mix. If you try this recipe out, let us know how you liked it! 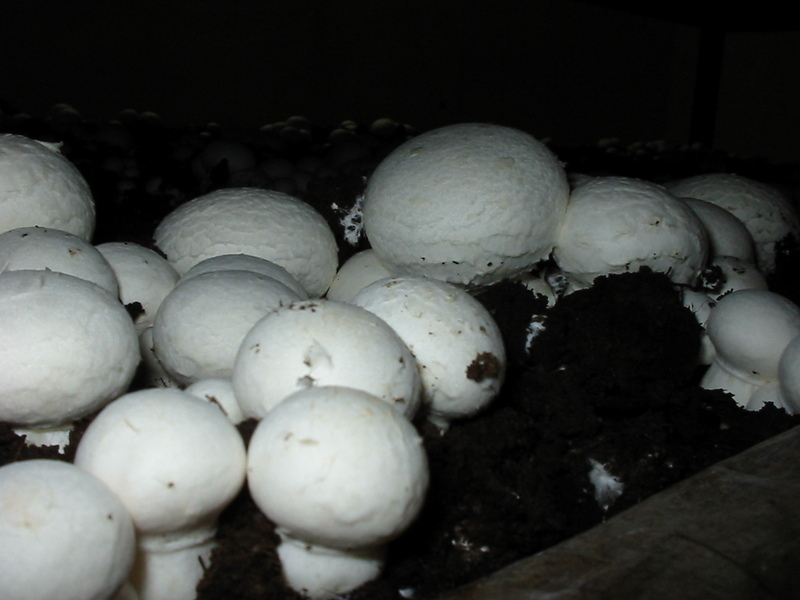 Can white button mushrooms enhance immunity? It’s that time of year again when many of us come down with the cold or flu. And as often as we pass around disease-causing germs, we also pass around advice on how to prevent and/or treat the cold or flu. Most of the advice I hear, beyond the usual getting enough rest, drinking plenty of fluids and hot soup are worthless. There are so many different foods and herbs that are said to boost the immune system, but in this post I thought we would look at a commonly eaten mushroom to see if it is helpful. These results suggest that increased intake of white button mushrooms may promote innate immunity against tumors and viruses through the enhancement of a key component, NK(natural killer) activity. This effect might be mediated through increased IFNgamma and TNFalpha production. Natural killer cells are important components of the immune system. They help fight both tumors and virus; low levels of NK cells may make you more susceptible to catching a cold or other illnesses. Since white button mushrooms(Agaricus bisporus) appear to enhance NK cell activity, it is tempting to extrapolate that it may help prevent or treat the cold or flu. At this point, this kind of conclusion would be preliminary, but since I already love mushrooms I think I will eat just a little more than usual these days. If you want to include more mushrooms in your diet, make sure you cook them first, since they tend to contain natural carcinogens(like agaritine) that are fortunately broken down by heat. Shiitake mushrooms are probably a better choice than white button mushrooms since they seem to have more medicinal properties and fewer carcinogens. There’s nothing like coming home to a hot soup after a run in the frigid cold. 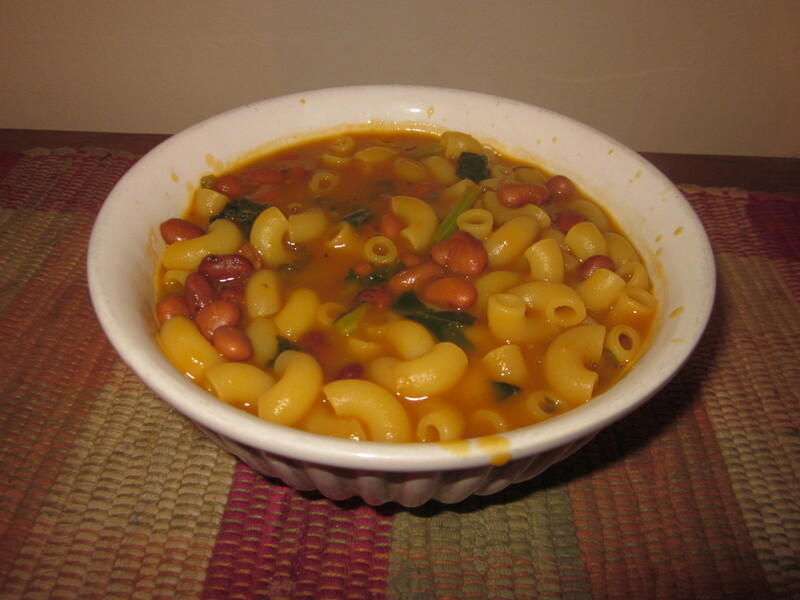 Pasta e fagioli is one of my most favorite soups and it is so easy to make. All I did was throw together some Trader Joe’s vegetable broth, pinto beans, elbow pasta, kale, a dash of olive oil, and a little pepper. My taste buds couldn’t get enough of it. It was wonderfully delicious and super nutritious. It’s an excellent recovery meal due to its high protein content. I suggest you try making it and experimenting with different legumes and vegetables. What kind of soups or recovery meals are you making this winter? Most of the early studies published on soy and breast cancer were not designed to test the effect of soy; the assessment of soy intake was usually crude and few potential confounders were considered in the analysis. In this review, we focused on studies with relatively complete assessment of dietary soy exposure in the targeted populations and appropriate consideration for potential confounders in the statistical analysis of study data. Meta-analysis of the 8 (1 cohort, 7 case-control) studies conducted in high-soy-consuming Asians show a significant trend of decreasing risk with increasing soy food intake. Compared to the lowest level of soy food intake (<or=5 mg=”” isoflavones=”” per=”” day),=”” risk=”” was=”” intermediate=”” (or=”0.88,” 95%=”” confidence=”” interval=”” (ci)=”0.78-0.98)” among=”” those=”” with=”” modest=”” (=”” approximately=”” 10=”” day)=”” intake=”” and=”” lowest=”” ci=”0.60-0.85)” high=””>or=20 mg isoflavones per day). 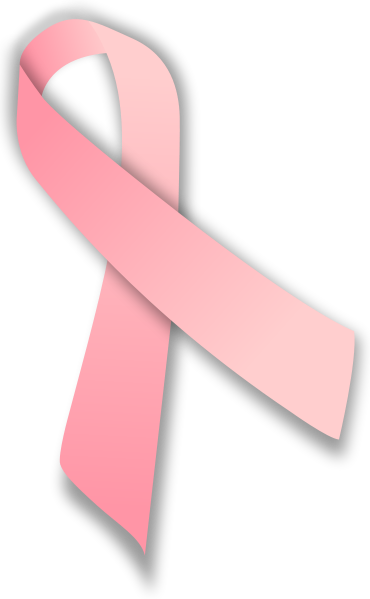 In contrast, soy intake was unrelated to breast cancer risk in studies conducted in the 11 low-soy-consuming Western populations whose average highest and lowest soy isoflavone intake levels were around 0.8 and 0.15 mg per day, respectively. Thus, the evidence to date, based largely on case-control studies, suggest that soy food intake in the amount consumed in Asian populations may have protective effects against breast cancer. For the longest time, “healthy eating” and “low fat diet” have been virtually synonymous. Low-fat diets are still popular among people trying to lose weight, as well as people trying to prevent or help treat heart disease. Runners on the low fat diet ate 19% fewer calories than on the medium or high fat diets. Body weight, percent body fat (males=71 kg and 16%; females=57 kg and 19%), VO2max and anaerobic power were not affected by the level of dietary fat. Endurance time increased from the low fat to medium fat diet by 14%. No differences were seen in plasma lactate, glucose, glycerol, triglycerides and fatty acids when comparing the low versus the medium fat diet. Subjects who increased dietary fat to 44% had higher plasma pyruvate (46%) and lower lactate levels (39%) after the endurance run. These results suggest that runners on a low fat diet consume fewer calories and have reduced endurance performance than on a medium or high fat diet. A high fat diet, providing sufficient total calories, does not compromise anaerobic power. So if you’re an endurance athlete, a low fat diet may hurt your performance. Just a little more can lead to significant improvements. Fat of course is a vital macro-nutrient, but the idea that fat is bad for you and will quickly lead to weight gain is still very pervasive. The truth is actually a lot more complicated than this. Generally speaking, plant fat is healthier than animal fat. In particular, mono-unsaturated fats like olive oil, and almond oil are heart healthy, unlike animal fat which is saturated and more likely to clog arteries. Mono-unsaturated fats tend to be liquid, while saturated fats are thicker, chunkier, and semi-solid. Fat is also better raw, since cooking it can make it unstable and more likely to promote inflammation. Trans-fats are the absolute worst and should be avoided at all costs. It’s like they were invented by evil scientists for the purpose of causing heart attacks. Omega 3 fats, which are abundant in flaxseed, walnuts, oily fish and certain species of algae are also good for you. The jury is still out on the long-term health effects of coconut oil, which is one of the very few plant sources of saturated fat. As for me, I tend to eat a moderate to high fat vegan diet. I eat a lot of nuts and often consume a lot of olive oil. In my case it is justified since I usually run over 40 miles per week. I usually prefer fat raw, but I am okay with lightly cooking it sometimes. Besides avoiding trans-fats, I also avoid palm oil. This is because palm oil production is largely responsible for the massive deforestation in South-East Asia, threatening to drive the Orangutan and countless other species extinct. Can ginger help with weight management? If there is one spice I could talk about forever, it is ginger. Oh how I adore ginger. This amazing root is packed with so many different natural chemicals that give it both its pungency and medicinal effects. Evidence suggests that ginger consumption has anti-inflammatory, anti-hypertensive, glucose-sensitizing, and stimulatory effects on the gastrointestinal tract. This study assessed the effects of a hot ginger beverage on energy expenditure, feelings of appetite and satiety and metabolic risk factors in overweight men. Ten men, age 39.1±3.3 y and body mass index (BMI) 27.2±0.3 kg/m(2), participated in this randomized crossover study. Resting state energy expenditure was measured using indirect calorimetry and for 6h after consumption of a breakfast meal with or without 2 g ginger powder dissolved in a hot water beverage. Subjective feelings of satiety were assessed hourly using visual analog scales (VAS) and blood samples were taken fasted and for 3 h after breakfast consumption. There was no significant effect of ginger on total resting energy expenditure (P=.43) or respiratory quotient (P=.41). There was a significant effect of ginger on thermic effect of food (ginger vs control=42.7±21.4 kcal/d, P=.049) but the area under the curve was not different (P=.43). VAS ratings showed lower hunger (P=.002), lower prospective food intake (P=.004) and greater fullness (P=.064) with ginger consumption versus control. There were no effects of ginger on glucose, insulin, lipids, or inflammatory markers. The results, showing enhanced thermogenesis and reduced feelings of hunger with ginger consumption, suggest a potential role of ginger in weight management. Additional studies are necessary to confirm these findings. Well doesn’t that just sound fabulous? Of course, even if this is confirmed by subsequent research, it doesn’t mean overweight people should rely solely on ginger to help with weight loss. At best, the effects would be modest, or could possibly get canceled out by other foods. Weight loss supplement companies though love to exaggerate the results from studies like this to get people to buy their worthless pills. They want customers to think “I can eat whatever I want so long as I eat it with ginger!”. After all, scientific studies “prove” that it works! Nothing, and I mean nothing can replace limiting calories and getting adequate exercise. There are plenty of other herbs and spices that can help improve feelings of satiety or suppress appetite, though practically none can help shed all excess weight over the long term in a safe manner. So while ginger may help relieve mild arthritis pain, don’t rely on it for weight loss.